A group of cyclists were recently pushed to their limits by an unusual coach -- an ostrich. Footage showed the lightning-fast bird bearing down on the group as they warmed up for the Cape Town Cycle Tour in South Africa on Friday. The massive bird kept pace with the athletes for more than a minute. But the Road Runner-esque animal eventually veered away and slowed down before the clip cut out. 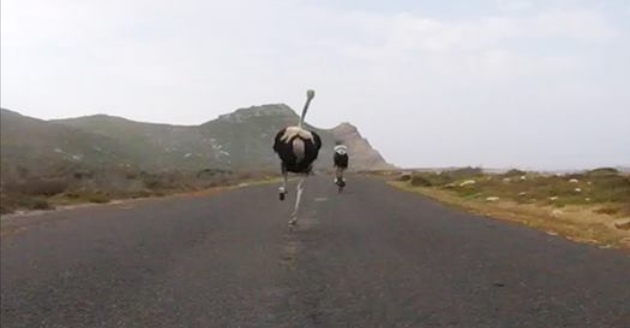 Mishchenko said the cyclists were "stretching out their legs" with an 80-mile ride to the Cape of Good Hope when the ostrich suddenly jumped on the road. "It was a little scary at first, but then I thought I gonna fell of my bike from laughter," he wrote in the video's description. "The ostrich didn't have any problem to keep up at 50km/h (31 mph) and apparently they do 70km/h (43 mph) with no sweat." Ostriches can indeed hit that top speed. According to the National Wildlife Foundation, they can even run for 10 miles straight at a steady 30 miles per hour. Responses to "Ostrich Goes Full 'Road Runner' To Chase Down Cyclists"
I wouldn't laugh too hard. Ostriches can be very aggressive and they have killed a few folks. Good thing this one didn't catch up with them!